Quote: The way you would like to be treated sets a minimum but does not limit how you must treat others. Hershel Becker was born in New York, to Holocaust survivors whose experiences fueled his passion for family and Judaism. 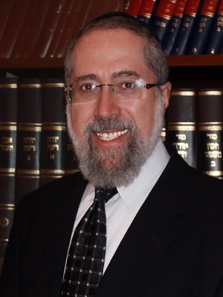 His desire to share Torah with a broader audience led him to Miami in 1986, where he serves as congregational Rabbi, educator, and beloved spiritual mentor. Love Peace: Blueprints for Lasting Relationships is his first book. The Spanish translation, Ama la Paz is also in print. How many conversations end with these words? Amidst the horror and grief of the unprecedented tragic events on 9/11, Rabbi Becker was inspired by a simple reality. As their lives were coming to a close, people called home to spouses, siblings, children, parents and friends to express their love. That was what mattered most. Yet, for many, loving connections may have been neglected until it was too late. How can we bring love to our lives? Where do we begin? The Torah contains the blueprints. “Rabbi Becker has drawn from this infinite source of Divine wisdom, emphasizing the character traits that will enhance harmonious interpersonal relationships.” - Rabbi Dr. Abraham J. Twerski. 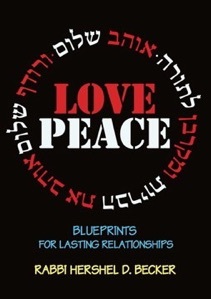 Love Peace: Blueprints for Lasting Relationships follows the weekly Torah portion and provides the resources to recognize attitudes and behaviors, modify them and benefit. It presents timeless information in a user-friendly format. Succinct and compelling essays are followed by questions that serve as a springboard for meaningful conversation that will involve everyone at the table, young and old. The time to say, “I love you!” is now! Love Peace is your personal coach for building and enhancing great relationships.